8 suites, 1 bathroom, 1 half bathroom, pool, sauna, jacuzzi, fitness room. Comfort, entertainment and safety in the paradise of Buzios. Located on top of Morro Humaita, with idyllic views of the sea and the Orla Bardot, between the beaches of Canto and Bones, between the main hotels in Buzios and close to the stones of the street trade. The main shops and restaurants of Búzios are two steps away and, despite this, the villa is in a quiet and safe area. In the comfort of the wooden deck that is born of the pool we have a terrace where we saw the beautiful vegetation of the area, overlooking the Bay of Buzios and its typical and colorful boats. Luxurious and spacious not only tastefully decorated but well equipped with everything you can expect to have quiet and pleasant days. 8 suites are finely decorated, all with air conditioning, sky tv, dvd, closet, small table for quick meals and closed circuit intercom. Pool, sauna, gym, jacuzzi, barbecue and laundry facilities. Flanked by beautifully kept gardens, has a small garden where you can spoon spices and vegetables. A small lake with ornamental fish graces its entrance. Parking for up to 6 cars and night watchman. Closed-circuit security cameras. The kitchen has all the necessary utensils for daily preparation of meals, as well as being necessary behaves hold small events. We offer four permanent staff services such as cook, maid, maids, general services, night security and driver for small shopping in the city center. We offer bed linen, bath and excellent table for all guests. The house has a very pleasant and secure environment. Suitable for families, couples, friends, children and the elderly. You and your family will feel at home enjoying the best services and without exaggeration with 5 star quality. All bathrooms have hygienic shower; anti-slip bath mat; double towel rail; clothesline; tempered glass box; hot water in the sink and in the shower, hair dryer, magnifying mirrors. We also provide bath towels and best quality face. We offer four permanent employees services such as cook, maids / cleaning lady, general services and night watchman. The Mansion Orla Bardot exceeded all our expectations. The luxurious and spacious villa is not only tastefully decorated but as well equipped with everything you could expect. The pool is large and the terrace is overlooking the bay of Buzios. The house can easily host the indicated amount of people. 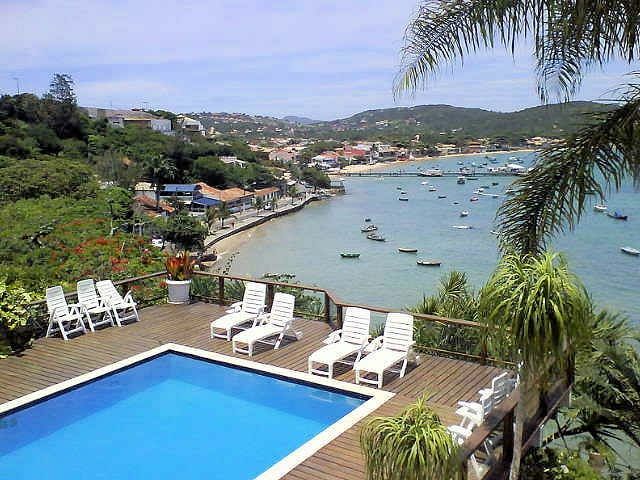 The main shops and restaurant of Buzios are 2 steps away and despite this, the villa is in a calm and safe area. The permanent stuff is very kind and heplful. The owner's description of providing a private home with 5 star hotel service is no exageration. We can 150% recommend the villa. The property manager has been helpful and service oriented from our first request throughout the whole stay and even beyond. Imóvel maravilhoso, só precisa melhorar o serviço de wifi pois o que existe na casa não funciona. Lembrando que estamos numa era que precisamos estar conectados sempre. Foram 4 dias maravilhosos com a família e amigos! A casa corresponde exatamente as fotos e descrição. A localização é perfeita com fácil acesso à Azeda / Azedinha, João Fernandes e Brava, além de ficar muito simples um passeio a qualquer hora na Rua das Pedras....Perto dos melhores restaurantes como o Satirycon e Sollar do meu amigo Danio Braga! A equipe é ótima, gentil e muito discreta. Enfim, vale muito a pena! Aproveitamos muito!!!! Livia e seus familiares foram impecáveis e cuidaram muito bem da casa durante o período que lá estiveram. Esperamos vocês em breve de volta ! Located at the top of Morro Humaita, with paradise overlooking the sea and sunset, between the beaches of Canto and Bones. Among the main hotels in Buzios and trade of Rua das Pedras.